The Ghana Interbank Payment and Settlement Systems (GhIPSS) launched an internet payment gateway to enable holders of domestic Automated Teller Machine (ATM) cards to make payments and purchases online. The launch of the ‘gh-link e-Commerce’ is to promote e-commerce and promote the creation of jobs as various services are needed in the e-commerce value chain. Definition:eCommerce can be defined as the conduct of transactions by electronic means. As in purchases of goods and services from online stores on the Web. These days many people spend quality time on the social media, commenting on issues and chatting with friends. 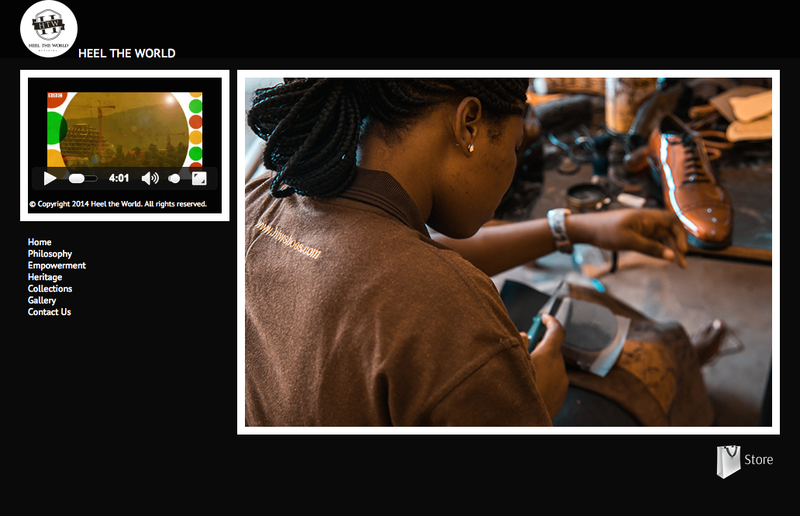 A number of small businesses in the Ghana are now on the Internet. They provide a platform where goods can be bought online and delivered to the customer’s doorstep. The emergence of retail online outfits such as Jumia, Konga and Kaymu has also increased people’s participation in this e-commerce. Experts observe that the present trend in e-commerce is a revolution that other entrepreneurs have also embraced. Different sectors of the economy are using the business opportunities this platform provides to expand their services. 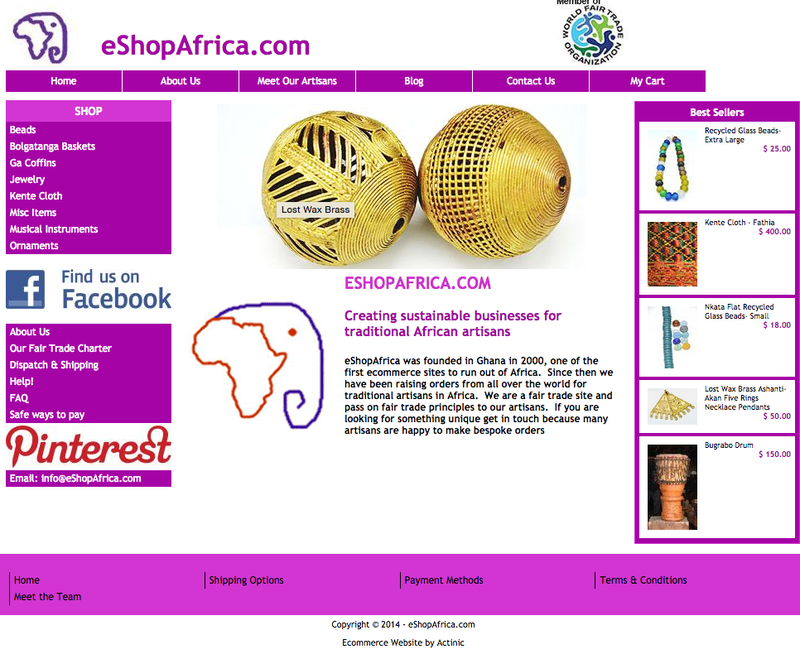 “eShopAfrica.com is a fair trade social business creating sustainable businesses for traditional African artisans. Based in Accra, Ghana. 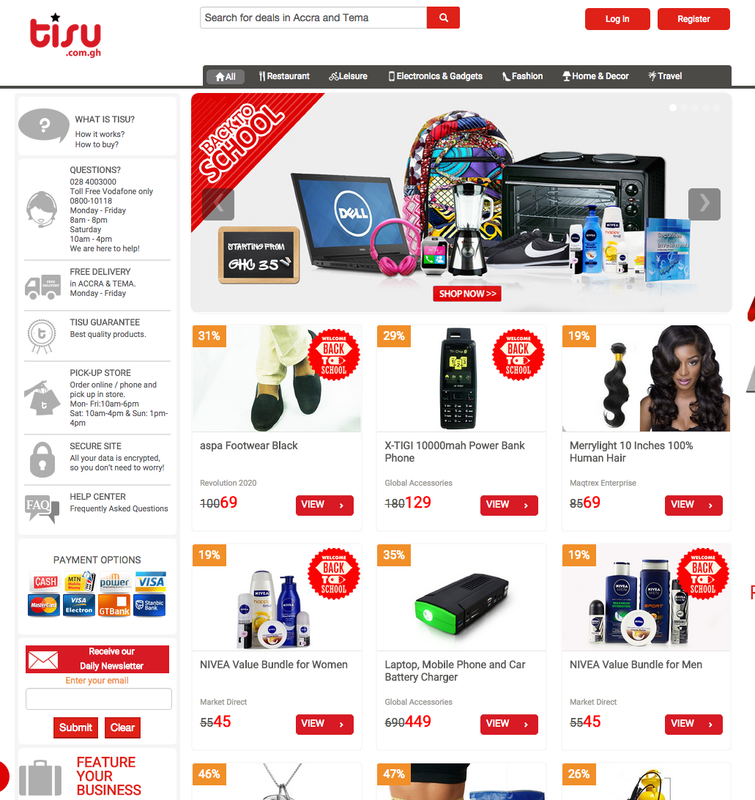 eShopAfrica.com has been trading online since 2001 and was one of the first eCommerce sites based in Africa. The company is registered in Ghana as an export only company promoting products from the non-traditional sector. 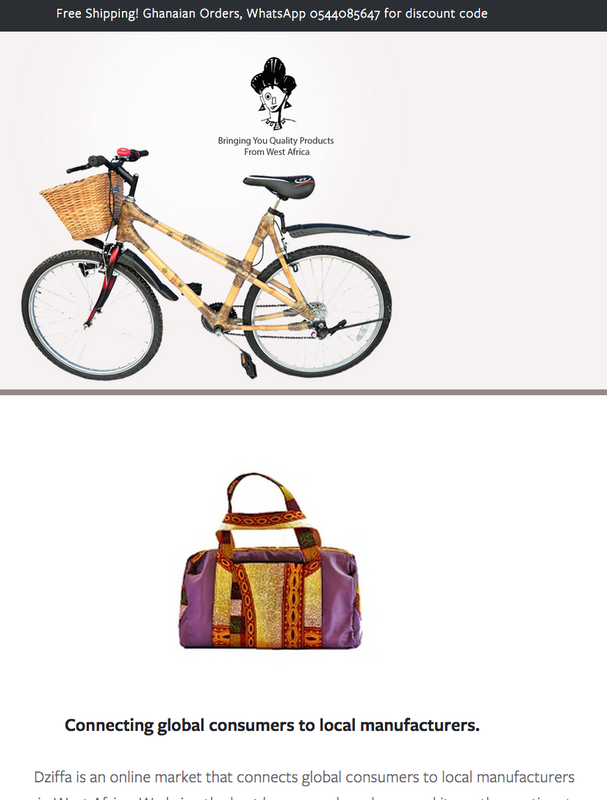 They claim to invest in their artisans enabling them to find new markets and grow their businesses in a sustainable way. Where possible we support artisans from the least developed sectors of society including artisan groups and community organizations. “Tonaton.com is a website where you can buy and sell almost everything. 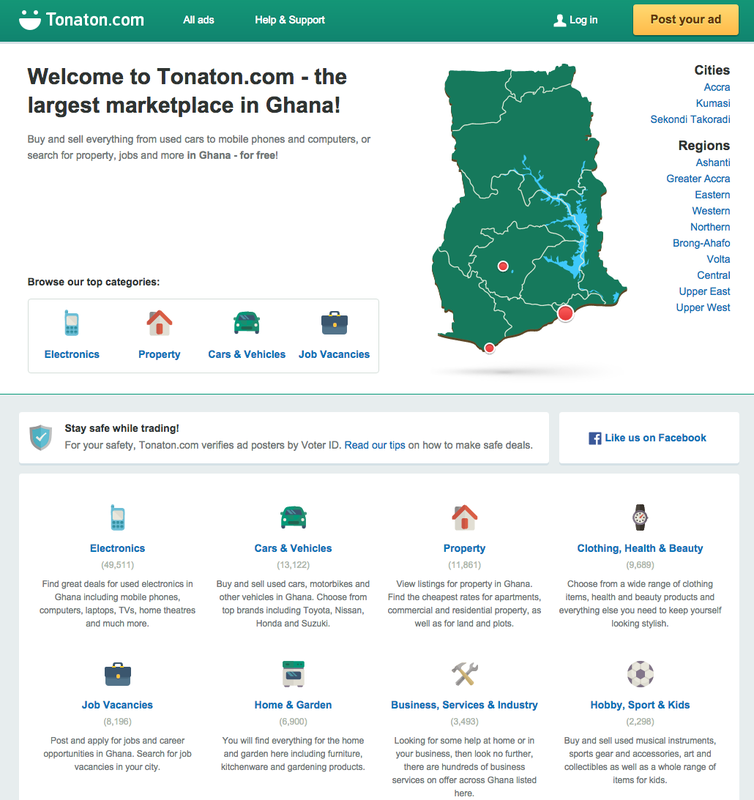 The best deals are often done with people who live in your own city or on your own street, so on Tonaton.com it’s easy to buy and sell locally. All you have to do is select your region. It’s completely free to publish a classified ad on Tonaton.com, and it takes you less than 2 minutes. You can sign up for a free account and post ads easily every time. 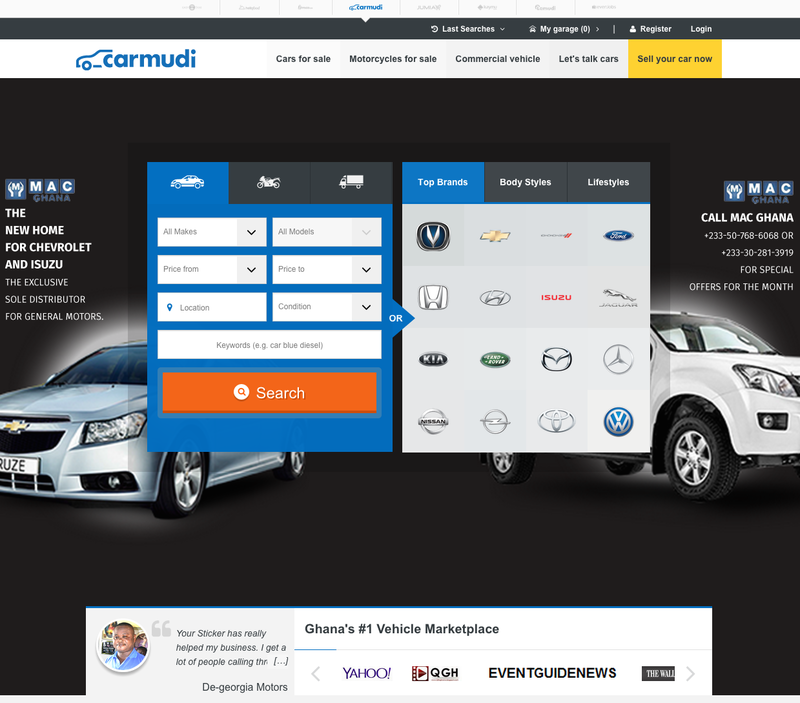 “Carmudi allows you to find the vehicle of your dreams. Our aim is to strengthen the position of consumers by providing information on the car market, then put in contact with individuals and professional sellers. They strive to ensure that every ad should provide the accurate information on each vehicle to make your choice easy. “We make high-end bespoke men’s shoes and leather accessories and use some of the proceeds to support people in the start-up space, collaborate with younger fashion brands, and have paid internships annually. “Lamudi helps people find their ideal home, land and commercial property. Our goal is to empower consumers with the most thorough information on the market and bring them in direct contact with the agents. Our listings aim at providing you with as much information as possible and an in-depth insight on each property. Lamudi Ghana (www.lamudi.com.gh) is setting the standard for providing a user friendly, highly visual marketing platform for properties and land in Ghana. 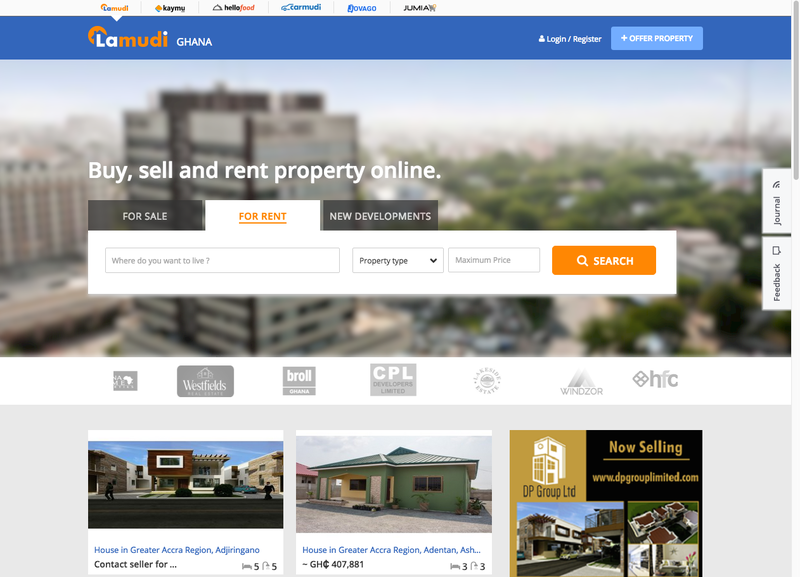 Lamudi Ghana already has over 400 properties listed on their website from individuals and the largest agencies and developers including Orel, Pelican Propertiesand Broll Ghana. Lamudi helps individuals find their perfect property and gives property owners an online presence. Well integrated with various social media platforms, individuals can save their favorite properties to their Lamudi accountsand send them to friends and family over email, Facebook, Twitterand Google+. Lamudi aims help you find your perfect property. We allow you to get in touch with the agents, who have the direct mandate for the property straight from the owner, bringing greater efficiency to the Ghanaian real estate market. 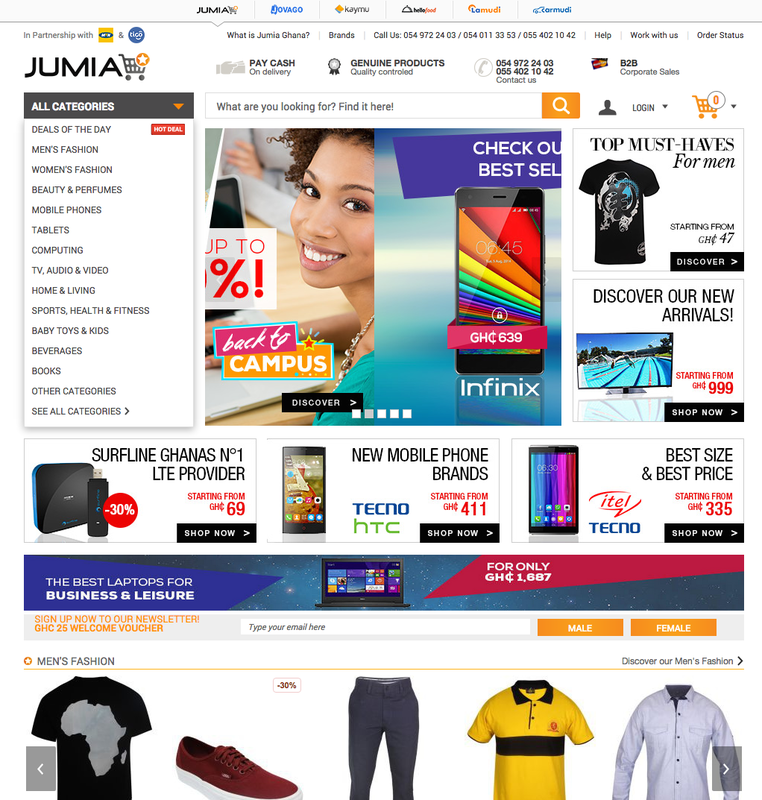 “Jumia – Africa’s biggest online shop for Fashion, Electronics, Home appliances and more. Jumia is your one-stop online shop for all your Fashion and High-Tech needs. We offer a wide selection of products including Men & Women’s Fashion, Mobile Phones, Computers, Electronics, Home Appliances and many more, bringing them right to your doorstep. 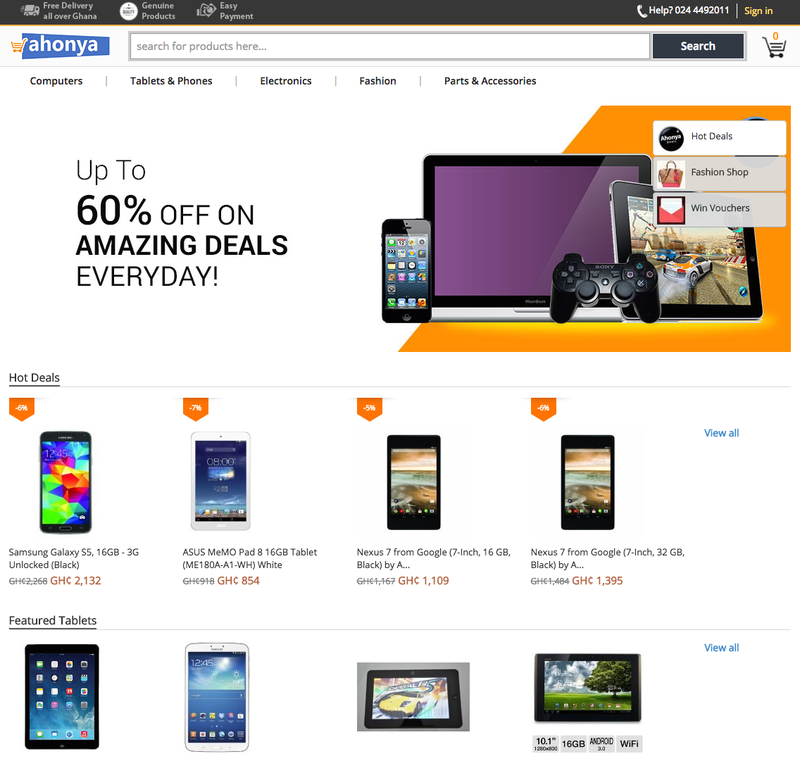 Jumia is available in Nigeria, Egypt, Morocco, Kenya and Ivory Coast. 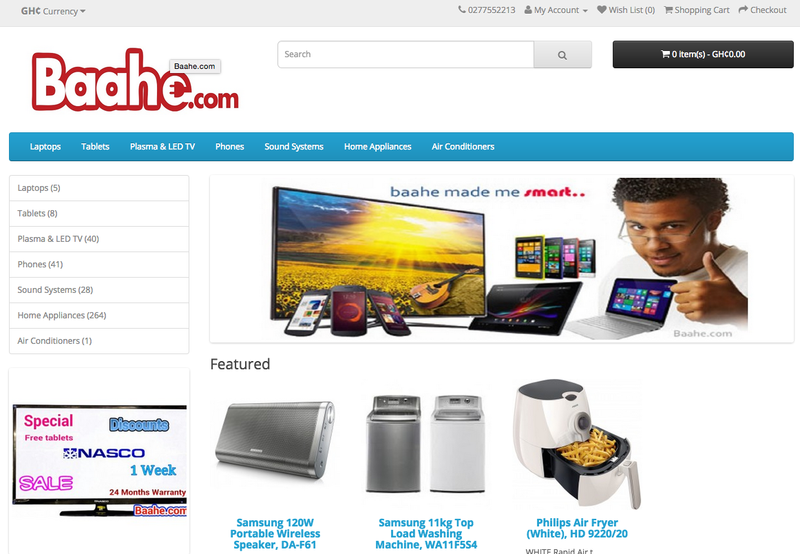 “Baahe.com is the subsidiary store to Kaizen Global Consult which specializes in the sales of high quality and affordable electronic devices as well as sales consultancy. We understand the importance of employees and our clientele. Our sales team work hard getting our valued customers the best deals in town. Our customer service department will address any concerns in a swift manner. 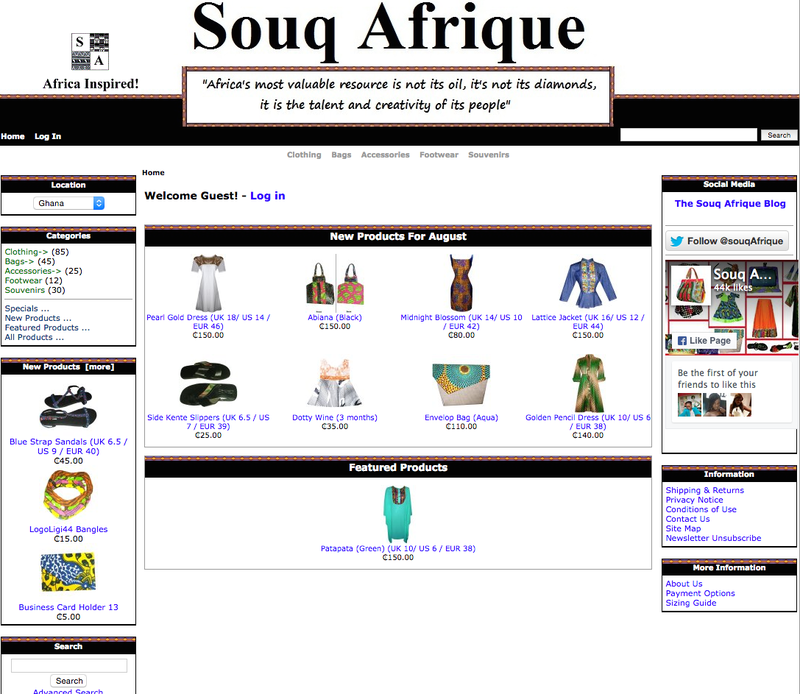 “Souq Afrique is a company that celebrates African creativity. We stock products that are made in Africa or inspired by Africa. Our goal is to be the one-stop-shop for Afro-centric goods not only within the continent, but also internationally. 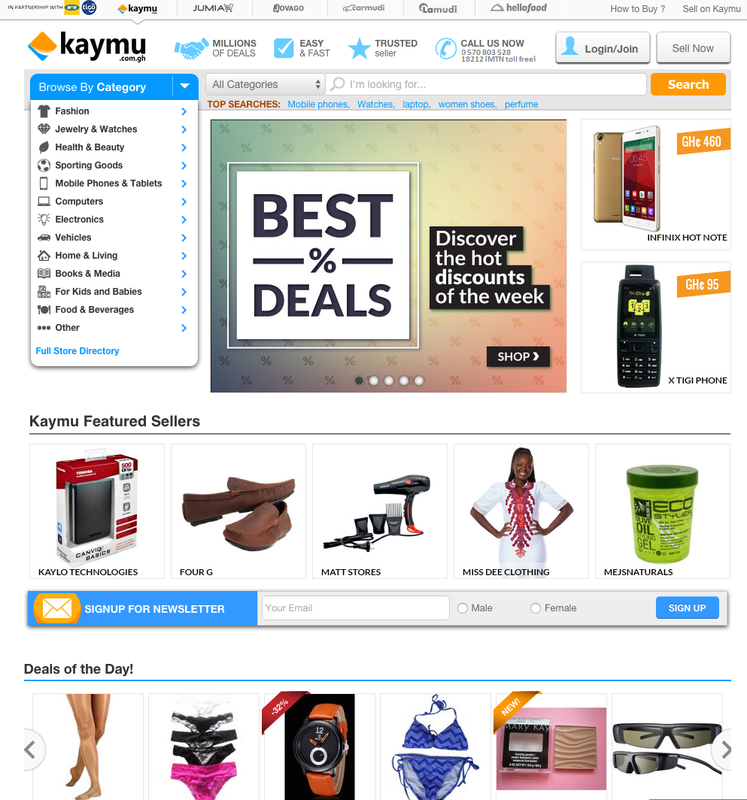 “Kaymu is the #1 online shopping community in Ghana. We connect buyers and sellers, but do not have any inventory of our own. 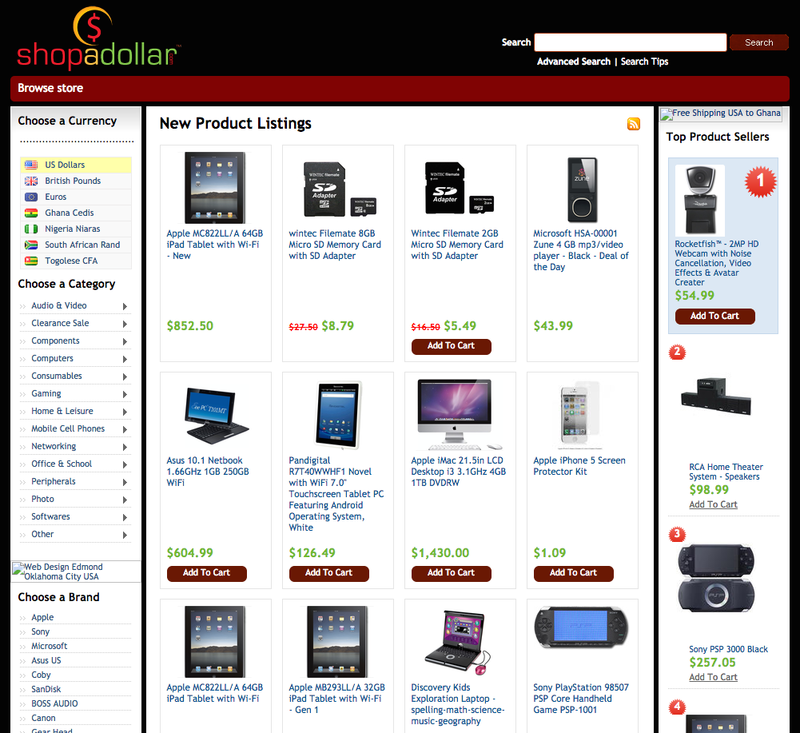 “We help people discover and buy quality products at amazing prices. We do this by putting the customer at the core of whatever we do. Whiles other are thinking about increasing prices, we think about reducing them. We want to make quality goods available to all in Ghana, no matter which town or city you live in. We are a team of highly dedicated individuals who share two things: a passion for problem-solving and a commitment to excellence. We’ve come a long way. It all started when were still in college and wanted the convenience of buying online. We couldn’t find any site we could trust to buy from. 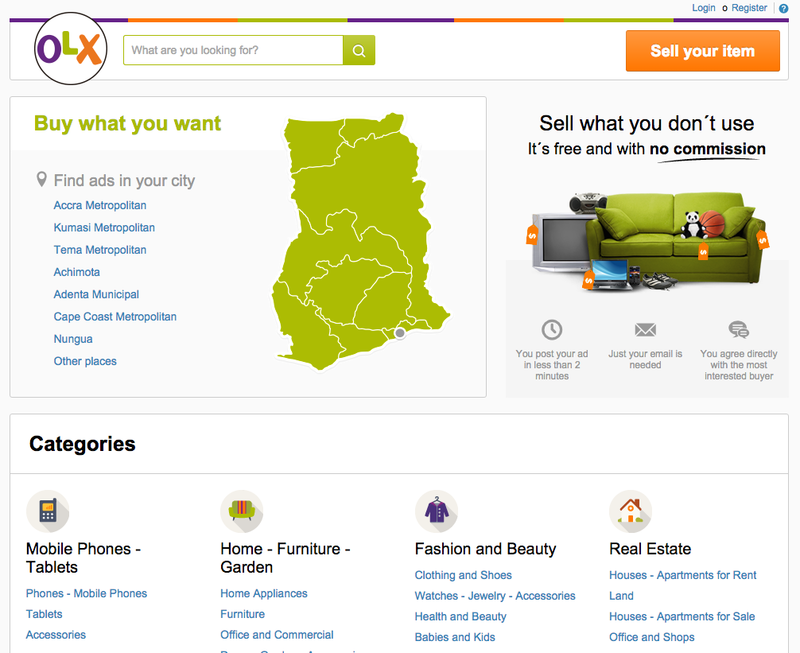 So we decided to solve this problem for the countless people in Ghana who want to buy online. Ahonya founded by Gerard Yitamkey, Philip Adzanoukpe and Addo Mensah. Ahonya is a twi word which means “wealth” or “affluence”. Since our college days, giving superior customer service and selling high quality products has been our mantra. The service garnered the confidence of Ghanaian internet users and has grown to this stage. 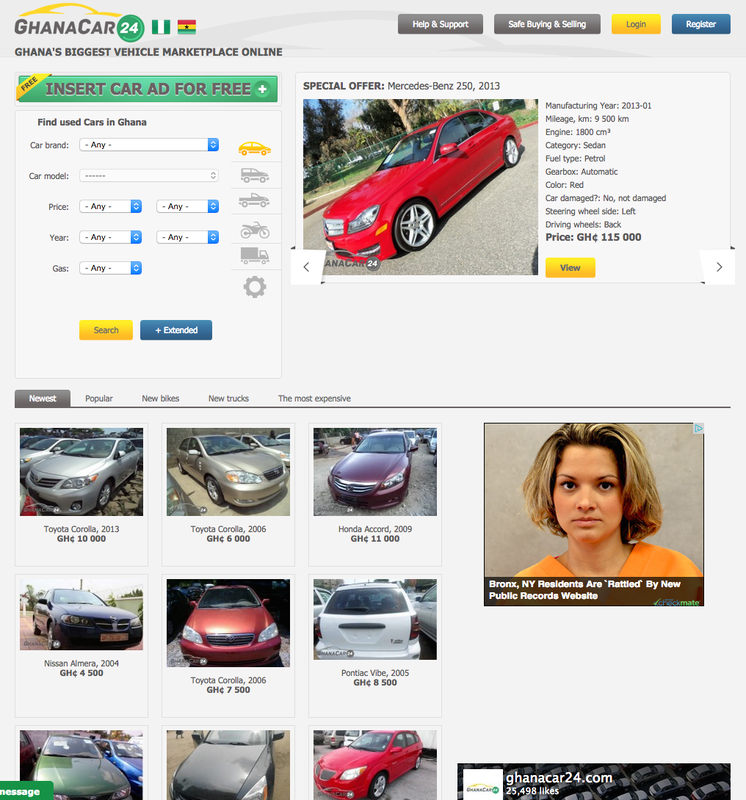 “Ghanacar24.com is an internet page where private sellers and dealers can list their cars for sale for free. Here each can find a proper vehicle according to his needs. Search for a car by a lot of criteria- price, year, color, mileage, power and more. Be sure you will find the right car for the right price. Our mission: To create biggest online car marketplace where buyers and sellers can meet each other. 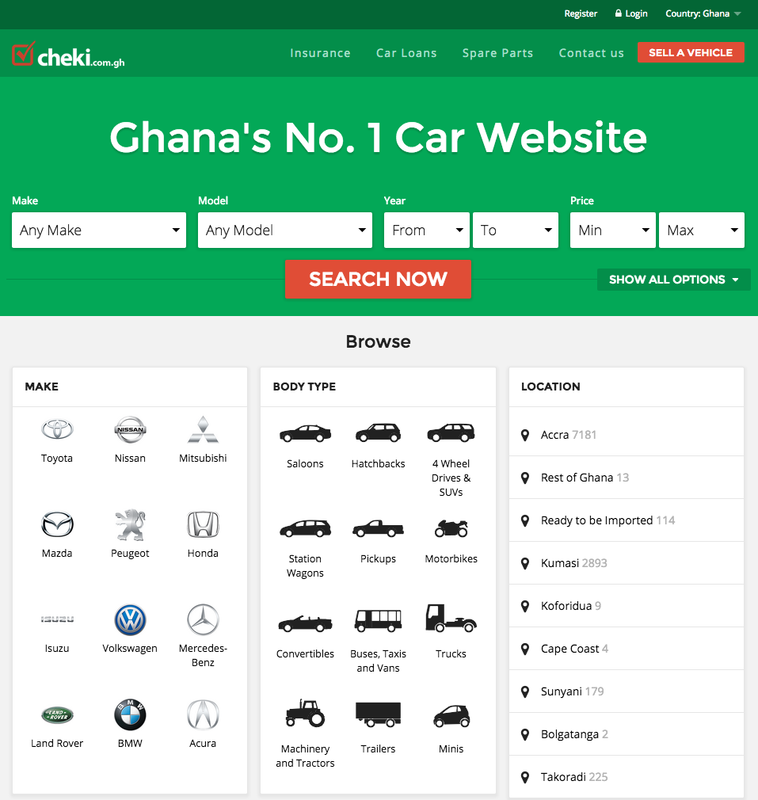 Established in 2010, http://www.cheki.com.gh is Ghana’s #1 Auto website with more car buyers and car sellers than any other site in Ghana. “Cheki.com.gh is an online marketplace where all of Ghana’s leading car dealers, importers and private sellers post their cars for sale in Ghana. We do not sell cars directly but rather offer a state of the art advertising medium for users to buy and sell their cars, 4WDs, vans, bikes and trucks and other vehicles. “Kpone Lobster Export Co. Ltd. was founded in December 1987 under the registration number 33820. After completion of the building, operation started in October 1988. The factory is situated at the Kpone Agro Industrial Area, close to the Tema fish harbor. The first directors of the company were Mr. Vanni Zarbo, the late Mr. Major Brown and Madame Matilda Tutuwah. In December 2007, the management of the company was handed over to Mr. Markus Oberholzer. Activities: Our core business is the export of fresh & frozen fish and lobsters, with Europe being the main target market. 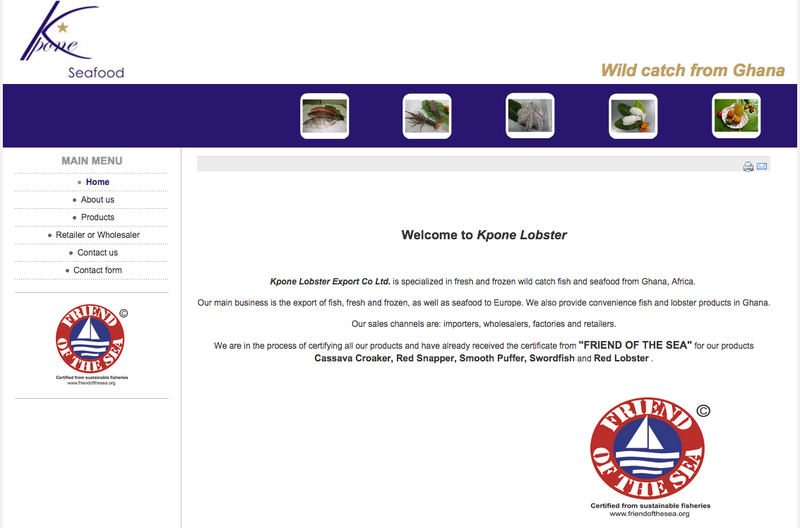 Mission: Kpone Lobster Export Co. Ltd. provides their customers with the best quality wild catch seafood from Ghana. HelloFood – Ghana’s No. 1 Online Food Delivery Platform. Order from 100+ restaurants from the comfort of your homes and offices! 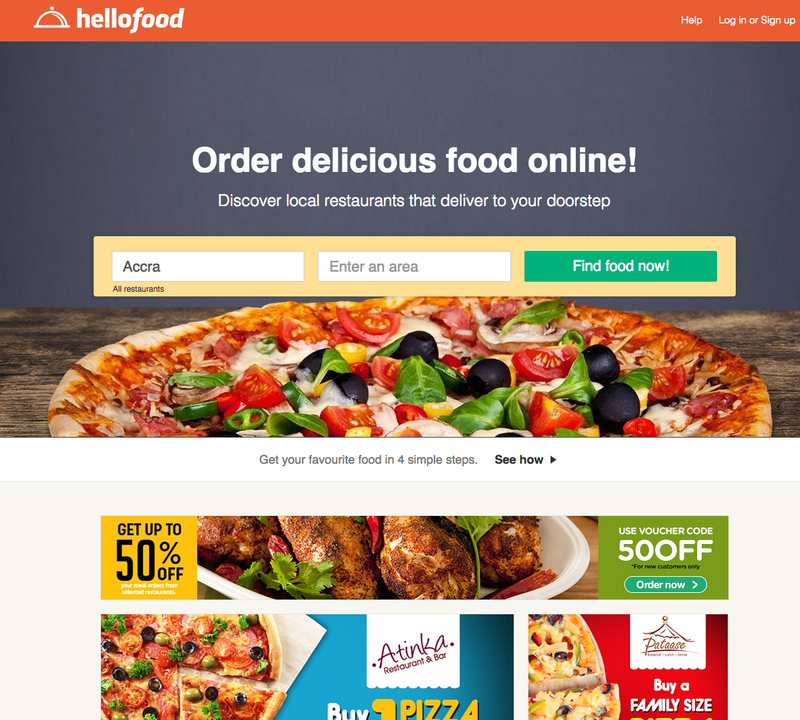 Backed by online veterans Rocket Internet, Hellofood has sister operations around the globe. Headquartered in Lagos, our team will soon be expanding to other cities in Ghana, and to the rest of Africa. 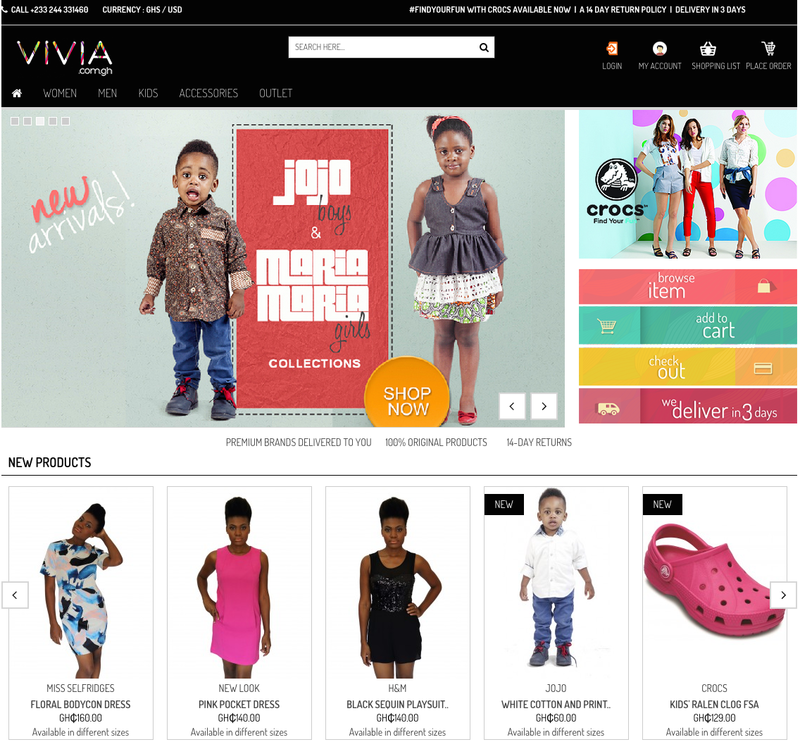 “VIVIA.com.gh is an aggregated online shopping site that offers various global and local brands of fashion & lifestyle products. By bringing top international fashion brands into the Ghanaian market and exposing the best local brands, VIVIA aims to become Ghana’s premium online fashion site and “first to mind” when customers think of shopping for quality, reasonably priced fashion and lifestyle accessories. Our clothing suppliers are carefully selected and we can guarantee that only the original products of each manufacturer are sold on VIVIA.com.gh. We provide premium products with an online shopping experience on par with global e-commerce standards, backed by a similarly high level of customer service. “Dziffa means, “It Brings Me Peace” in the Ewe language. We strive to bring you peace by offering you the best handmade products in Ghana and to bring our local manufacturers peace by increasing their consumer base. We started operating in Ghana in 2006 with a small team of personel. 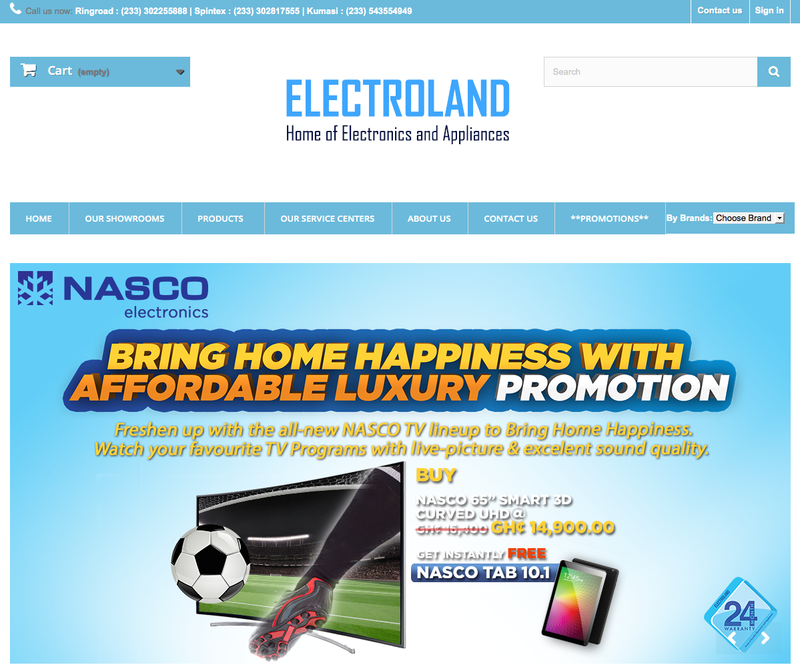 we currently are the biggest ELECTRONIC & APPLIANCES distributor in Ghana with a nationwide coverage. Thanks For the list. 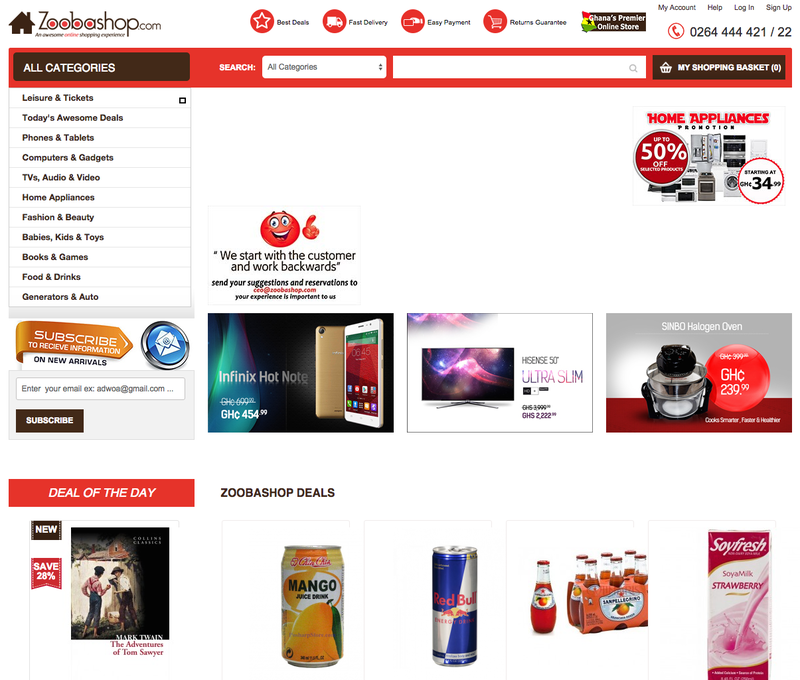 You can also add Reapp Ghana to this list, an online shopping site for all your needs.